Sure, instead it should be dismissed because it is unnecessary and adds nothing to our knowledge. It's truly meaningless even if it is true - and we can never know if it is true or not. It's basically a totally useless and completely interchangeable with "I don't know". So the problem is not with science that it can't be disproved - the problem is with deists in showing us why it's worth worrying about at all. If science is not your only tool of rational inquiry, then there may be other ways to prove or disprove deism. I agree that I'm not sure why Deism is worth worrying about. Yet here I say, writing pages about it. Uhmmm.. Boxcar my old pal; check out the OP, which I started. It's actually about the Scientific Method and it's understanding and acceptance by the community at large. It's relevant that this poster, KD, seems to deny it's functional relevance and strengths, versus his version, which relies on supernatural events with no evidence in hand. Did I miss a complete re-direction of my thread somewhere in here, mutating into your claimed debate about Deism & theism? I had no idea myself! Prove to me from reported or recorded evidence that it was between exactly those dates. Then determine the values of judgment by which the subject develops. Is your point we wait for him? 1. Probability is different than Probability Distribution. 2. Probability is a statement of likelyhood that is by convention expressed mathmatically in a range from 0 to 1. 3. Strictly speaking, Probability does not have a range or distribution itself, but the data underlying it has a range and distribution. 4. 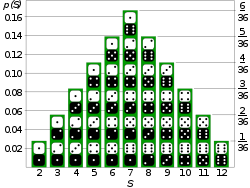 Probability distribution, on the other hand, is a statement expressing the likelyhood of a series of outcomes. 5. For example, if I rolled a dice, probability would be used to describe the likelyhood of getting a particular outcome, "3" for example. The probability of rolling a 3 is .166666. 7. The above probability distribution table is not the same thing as a simple probability. I eagerly await your analysis. Last edited by Blue Hue; 10-21-2011 at 11:23 PM.. If the range is infinite, then there is a 1/infinite chance for each of the infinite individual possible theories to be correct, which is to say there is an infinite distribution of theories, each with a zero percent chance of being correct. But that's a pretty strange way of looking at it. I don't the question made much sense. Last edited by Blue Hue; 10-22-2011 at 02:17 AM..
Last edited by Blue Hue; 10-22-2011 at 03:47 AM..